For hot-air ovens of kitchen ranges MORA | Backer-Elektro a.s. 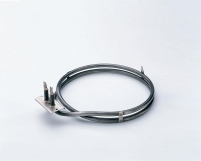 The heating unit consists of a heating branch that is attached to a metal sheet flange. It is equipped with screw terminals M4. The sheath is made of stainless steel. The heating element is intended for hot-air ovens of kitchen ranges. Forced air circulation should be provided during operation. The element can also be used for other devices, in which similar operation conditions should be provided.